Ok, I warned you that I had a few Christmas titles that I had accepted for review which needed to make an appearance before December. (At least we are now officially in November. This has to help a little bit, right!) One of those titles mentioned is by one of my favorite Christmas authors, Donna VanLiere. I've read and reviewed several of her Christmas titles in the past and when I saw that there was a new one coming out I was quite excited. Really, I wanted to save The Christmas Light to read in December because I find VanLiere's books fun to read when life is really busy and the Christmas lights are on. But for the sake of the review, I made myself read it (and found something else to set aside and read later). Despite the fact that I was reading this Christmas story in October, I still found myself quite able to enjoy it. It is, as every other book of hers that I have read, easy reading with a festive feeling about it. The Christmas Light is something of a Christmas romance. The heart strings are tugged on a bit as you meet widow Jennifer who is struggling to raise her daughter all by herself. She meets divorcee (not by his choice) Ryan who is also raising a daughter on his own. There is relational tension between them throughout the book which keeps you wondering exactly how long it is going to take for them to get together. Throw into the mix an unplanned pregnancy of one sixteen-year-old girl and a hopeful story of the building of family and you have yourself a Hallmark Happy Ending. This "neat and tidy" story is not off-putting to me because sentimental happy stories are precisely what I hope for from VanLiere and it is nice not to be disappointment. As previously mentioned, I like reading VanLiere's Christmas stories in December because they aren't deep reading but are happy distractions in the midst of busyness. It takes just about as long to read one of her books as it does to watch a Christmas Chick Flick - only in this case my husband doesn't necessarily have to give up his time to it. (grin) I don't necessarily enjoying re-reading VanLiere's works but pick out one new one each year to read. (I also don't have to re-read them because they are memorable. Especially when songs and movies are made out of them.) It is nice to spend it reading something purely for entertainment sake during the flurry of Christmas activities. I also like these books because they are squeaky clean. You do not have to fear that you will stumble across bedroom scene or foul language and that helps me to further relax and just enjoy the story for what it is. All in all, these are quick pleasant reads. If you are looking for clean Christmas fiction, check out VanLiere. Any title will do. If you've not read her before, or if you are interested in reading this new title I have happy news for you. 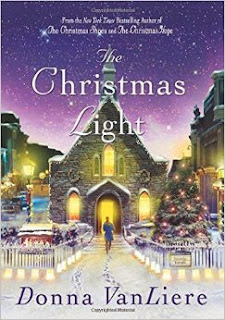 St. Martin's Press has offered to give away one copy of The Christmas Light to one of you! To win? Simply leave a comment below (REMEMBERING TO INCLUDE A VALID E-MAIL ADDRESS!!!). This contest is open to U.S. Residents only and will be open through Wednesday, November 12th. THIS CONTEST IS NOW CLOSED. THE WINNER, as selected by Random.org, IS #9 - Anita. CONGRATULATIONS! Many tanks to St. Martin's Press for sending a copy of the above title in order to facilitate this review. I received no additional compensation for this post and all opinions are my own. I read this one in October and decided to post it this morning, too. And, I can throw my recommendation into the mix. I really enjoyed it. Sounds like a fun easy read.. just right for Christmas. Thanks for all your giveaways! Guess I need to put these on my holiday reading list. Can't believe it's just around the corner! I have not read these books. They sound like wonderful for this time of year! I haven't read her before, but I do like light Christmas reads and want to try her out! I enjoy reading about Christmas romances, and this one sounds special. I would love to read it. Thanks for having the giveaway.